How do they celebrate Christmas in Spain? Christmas lights start going up in towns from the end of November, or early December. Christmas trees are quite popular now, although the more traditional decoration is the nativity scene (known as a belén) which can be found in churches, public places and homes all over the country. Christmas celebrations start on December 24th (Nochebuena) when families go to midnight mass (La Misa de Gallo) and then have a meal together. The meal itself varies from region to region but dessert tends to be sweets made of marzipan or turrón (nougat). December 25th (El día de Navidad) is a quiet day. 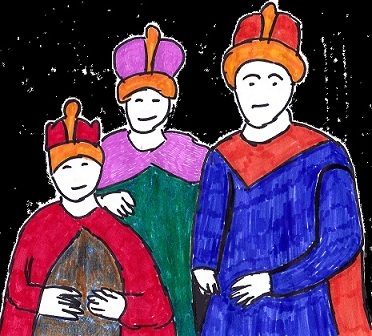 Families get together again for a meal, and they may exchange small gifts, but the real day for giving presents is January 6th, the day the Three Kings (Los Reyes) saw baby Jesus. On January 5th there are processions all over Spain to celebrate the arrival of the kings. Traditionally they came by horse, but these days they may arrive by car or even helicopter! You can see a video of the three kings arriving by helicopter here. On the night of the 5th, children leave their shoes out, filled with straw and carrots for the kings’ horses, and in return the kings leave presents. On this day there is also a special cake, known as Roscón de los Reyes, which is shaped in a ring. Inside is hidden a small charm. Tradition says that whoever finds it will be lucky for the next year, and they are also crowned king or queen for the day. Sometimes there is also a bean hidden in the cake, and whoever finds this has to buy the cake the following year! Happy Christmas in Spanish is Feliz Navidad and Father Christmas is Papá Noel. If you want to learn Spanish and you are based in Birmingham, you can contact me via my website for private Spanish lessons. Related posts: How do they celebrate Christmas in France? How do they celebrate Christmas in Greece? How do they celebrate Christmas in Germany? How do they celebrate Christmas in Denmark?